Over the past year, Trail to Peak has really grown into a hiking and backpacking focused blog with a few forays into the world of urban exploration. It’s funny to think that urban adventures were what first got me into blogging. Lately, I’ve been making it a point to do a little more exploring in the concrete jungle, so that I’m not just spending every weekend in the mountains. When getting ready for an urban adventure not too long ago, I realized I only have work clothes and hiking/fitness clothes, with not much in between. I’m not much of a fashionista, but I’m also not one that likes to stand out in a crowd. Many of my pants do double duty, and I’ve really been loving my Columbia Silver Ridge shirts, but it was my footwear that was standing out in the wrong way. I was doing some research to find a sporty and athletic looking shoe, that could also hold it’s own in a museum or restaurant, when I got an email asking if I wanted to try the Ridgemont Outfitters Monty Lo. I did a little research, and after reading about Ridgemont Outfitters on their website, gave an enthusiastic “Absolutely!”. 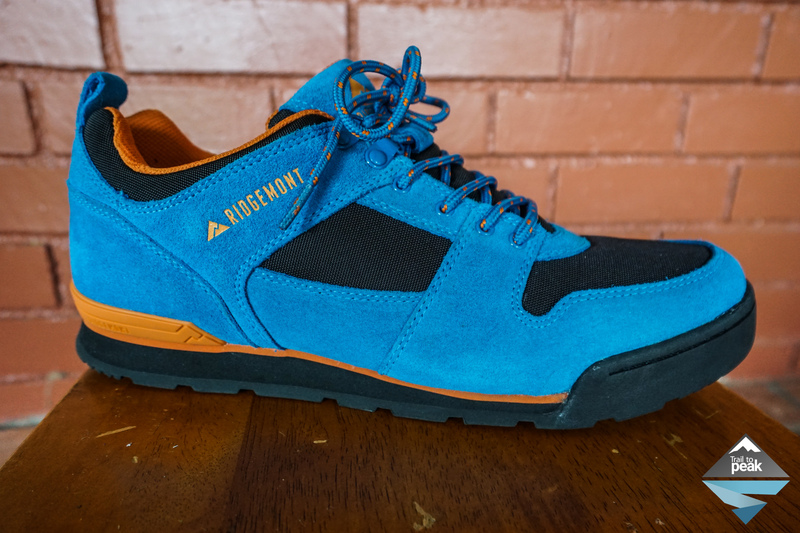 “Ridgemont Outfitters is redefining what rugged outdoor footwear can be. We don’t believe that just because you want your shoes to handle tough conditions, you need to look like you’re about to summit Denali.” This description perfectly sums up what Ridgemont Outfitters is all about, and why I find their shoes so attractive. I’m a huge fan of the outdoor look, but it’s really nice when you can blend it with something a little more refined. The Ridgemont shoe lineup does this perfectly, with a stylish shoe lineup carrying options for every occasion. I’ll probably end up getting another pair of Ridgemonts in a more subdued color for less causal affairs, but for the pair provided to me by Ridgemont, I went with the rockin’ blue and orange color combo. I’ve worn these a few times now, and am really loving my first impressions of this rugged and stylish footwear. Unboxing the Monty Lo was a really nice experience, as Ridgemont uses a great topographic paper wrap for the inside of the shoe box. **I received this shoe in a size 12, and the fit is just right. I order my hiking shoes in a 12.5 for the extra toe space, but prefer my daily drivers to fit with a little more precision. The Monty Lo upper is made from oiled suede and high grade nylon. The inside of the upper is very comfortable and perfect for long days when you’ll be spending a lot of time on your feet. These shoes are marketed as the the bridge between hiking footwear and dressier options, and Ridgemont has done a great job of pulling it off. I would say the fit and feel of these is very close to an approach shoe. The first shoes that came to mind for me were the Scarpa Crux and the Five Ten Guide Tennie. The lacing system allows for a customized and precise fit, which is really nice for multipurpose footwear. This is the kind of shoe you can take for a hike at Griffith Park, step inside to explore the museum, and the grab a dinner in LA for night cap. The midsole on the Mone is a very comfortable and responsive EVA foam that does a great job at absorbing shock and kept my feet feeling fresh. The outsole was the biggest surprise for me, as they offer some serious grip. They are not lugged, but the compound used kept me feeling very secure on the hiking paths I tested them on. If you’re looking for a great pair of versatile footwear that you can take for a hike and then out for dinner, give the Ridgemont Montys a look. They’ve proven to be a very comfortable and functional pair of kicks for me, and I’ll never get sick of hearing the compliments on their great looks. Now that I’m not looking like such a hiking bum when I go out places, I’ll probably be more inclined to do a little more urban exploration in the LA area. Most importantly, Isla approves of the Monty! Quite a funky looking shoe! Not sure about the bright blue though… Im definitely more of a subtle black look! I love the blue and orange! But I also think the black would be a good bet for transitioning from being out and about to a restaurant or something like that. What were these like in the rain? Hello Ben. I haven’t worn these in the rain, so can’t comment on that. If you plan on getting them wet, I’d suggest a water resistant coating, as they are not waterproof out of the box.